The 14th meeting of the year, held yesterday afternoon, heralded the start of the prestigious Tazza l-Kbira championship for Premier Class trotters only, on a long distance of 2,640m. The Easter programme consisted of eight races, all for trotters and on various distances. Noel Baldacchino finished the best driver of the meeting with three wins to his credit. From the five Premier races, 20 horses made it to the semi-final stage of the championship. In the first heat on the card, early leader Wee Catch Diamond, under the guidance of Gozitan Julian Farrugia, started to slow down around 300m from the finishing line. 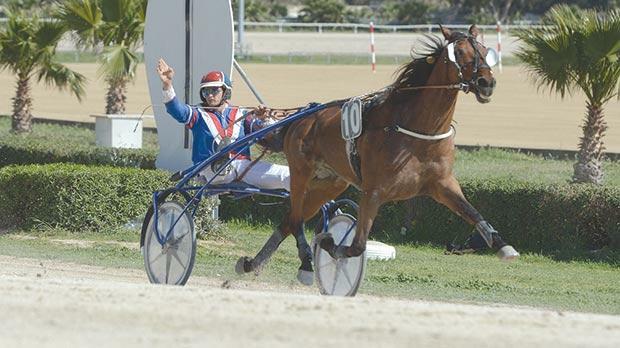 This German trotter was overtaken by Qui Sait (Rodney Gatt) which secured its first win of the year by a length from Turnover (Frenċu Cassar) and Quesito d’Or. The latter was driven by Frenċu’s son, Anton Cassar. French newcomer Uvario (Charles Debono) was fourth as Wee Catch Diamond failed to make the cut. A keen duel between two French trotters, Pedro Vici (Johan Axisa) and Quo Williams (Charles Camilleri), developed in the final straight of the second Premier heat. Pedro Vici went on to gain its first win of the year at the post with Ourasi Diams (Anthony Fenech) and Retz Du Lys (Kurt Saliba) coming home third and fourth place behind Quo Williams. Pedro Vici clocked an impressive time of 1.13.9” per kilometre. This was the best timing registered for the five Tazza l-Kbira heats, yesterday. In third heat, Swedish Vejby Boom (Carl Caruana) nosed ahead midway through the straight and managed to grab its first win of the year in front of Nelson Derm (Anton Pace). Favourite Nico Oland (Julian Farrugia) and Cloria Victis (Michael Ellul) followed in third and fourth places, respectively. Favourite Quefi Des Caillons (Michael Ellul) shifted to cruise mode before securing its second win in a row and third this season in the next heat. Quefi Des Caillons increased its pace with a lap to go and triumphed without difficulty from Jaguar Ruda (Anton Cassar) and Quebir De L’Aube (Clint Vassallo). Brigadoon (Rodney Gatt) also qualified after finishing fourth. In the remaining heat, Matrix Revolution (Noel Baldacchino) and Quiet Du Chene (Mario Fenech) sprinted neck and neck in the dash to the post. In the end, it was very difficult for the racing stewards to determine which horse was the winner of this heat even after that the photo finish was consulted. So, both trotters were declared winners. Donald Duck Tooma (Caillin Borg) and Overtaker By Sib (Marco Refalo) were the other two trotters to qualify for the semi-finals. Another meeting at the racetrack will be held on Thursday.